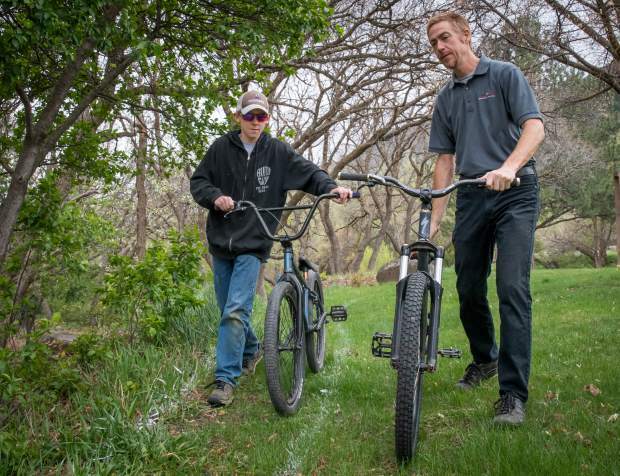 Noah Davis, left, and Randy Tuggle, the Glenwood Springs High School mountain bike team coach, take a look at the path for the future BMX course at Veltus Park. An idea to build a new bike terrain park in Glenwood Springs’ Veltus Park is pedaling its way before city officials and the public. Currently, the 8-acre public park, more commonly known as Kiwanis Park, sits along the Roaring Fork River at the corner of Midland Avenue and Eighth Street. It offers everything from tennis and basketball courts, to barbecue pits, and even a wheelchair-accessible fishing ramp. Preliminary talks for a bike terrain park began in February when Rick Fout gave a presentation before the city’s Parks and Recreation Commission. While the majority in attendance supported the measure, there were still questions regarding location, sustainability and costs. As a result, the commission requested a mock-up design of what the park may look like inside Veltus Park specifically. After researching other such parks, like those found in Boulder, Frisco and Carbondale, and surveying the possible future project site itself, new details have emerged. Right now, consultants for the project have their eyes set on constructing the terrain park in the less-developed, upper portion of Veltus Park, and it would include three riding areas, tentatively called the Kiddie Track Attack Line, the Big Kahuna Line and the Pump It Up Track/Teen Wolf Lines. Although the proposed locations appear in different sections of the upper portion of Veltus Park, each riding area would implement the project’s overall philosophy of bringing riders of all skill levels together. With that being said, all three riding zones would offer trails ranging in difficulty from green to black. The Kiddie Track Attack line, however, would also include an ultra green beginner trail. One specific question raised by the public regarded how many trees would come down if the bike terrain park were approved, and what toll construction would take on the existing grounds. Buell stated only three trees may need removal if the project were to eventually get the go ahead from Glenwood Springs City Council at a later date. Construction, ideally, would also take place in phases as opposed to being done all at once. The Big Kahuna Line, which would reside between the other two riding areas, would get built first. According to the consulting firm Singletrack Trails, the total projected cost for the bike terrain park would fall in the neighborhood of $109,613. However, this number may increase if better drainage and erosion control required but could also decrease depending on volunteers and donations. “It definitely just kind of varies,” Buell said. “But in terms of, you know, things we’ve donated, there’s a lot of stuff that community businesses and members either just had the resources to donate, whether it’s dirt, time, construction skills, and things of that nature. Proponents for the project created the website bikeglenwood.org and on it invite visitors to take a short survey for more public feedback. The next Parks and Recreation Commission meeting will take place May 9 at 5:30 p.m. at the Glenwood Springs Community Center. There proponents will give another presentation on the terrain park, and the public will have another chance to comment and ask questions. Interested in bike parks? Read about the county’s existing options in our 2018 Cycling Guide.